How to meassure a cylinder? Wenn you want to order a cylinder, you have to give us a length. This length is build up 2 sizes, A the outsidelength and B the insidelength. The length depends on the thickness of the door and the thickness of the security-plates. A doorthickness of 40 mm (inner door, appartements door) is a very common meassure but in new constructions and abroad more and more thicker doors appear. In this cases is standardlenght 60 mm not enough. Meassuring a cylinder is not so hard. The lenght is meassured from the middle of the cylinder, where the screw sits to fasten the cylinder. Meassuring a cylinder out of the door. 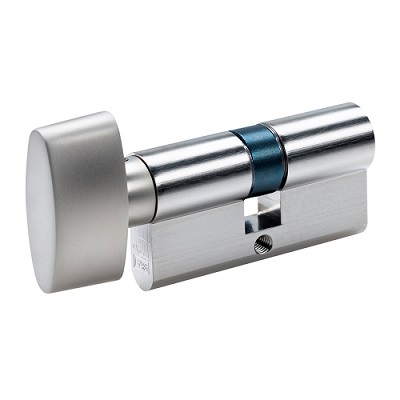 The easiest way to meassure a cylinder is to take it out of the door and then meassure it. You have to unscrew the screw on the lead end of the door, move a little with your key and then pull out the cylinder. Now you can meassure the lenght, both sides of the screwhole. The standardlength is 60 mm or 30 mm left and 30 mm right = A/B = 30/30. This length can be extended at both sides with 5 mm each time. By thick doors, more than 40 mm, the cylinder is often placed NOT in the middle of the door and that's why the cylinderlength has to be adjust to this situation. Therefore is the length as 50/45 a very common lenght f.e. with aluminium doors, but also all other possible lengths can occur. Meassuring a cylinder in the door. 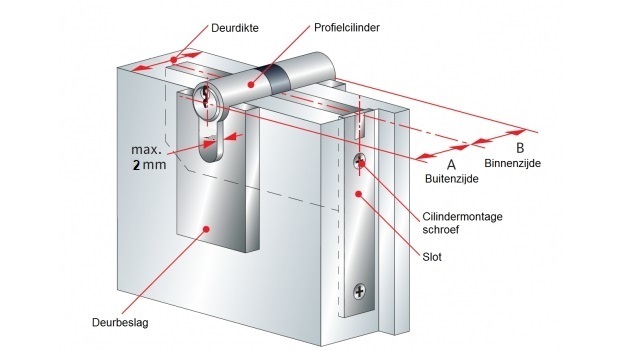 You start with meassuring from the cylinderscrew towards the outside of the door and measure the doorthickness and the thickness of the plate. For the inside you repeat this action. You meassure from the cylinderscrew towards the inside of the door and meassure doorthickness and thickness of the plate. All different combinations are possible. We offer 2 types of modulair cylinders (K10 & Tokoz), causing really ALL different meassures to build. Extreme lengths you won't find on our E-shop, this is to be asked on email. Every cylinder in our product range is available with rotary knob on the inside. This is very often placed on front or backdoors. So you can easily lock or unlock your door every moment you want. You don't need a key, you just turn the knob. A great benefit of the knobcylinder is wenn fire or any other situation with panic appears you can very easy leave your house by just turn the knob and unlock the door. You don't have to search for your key. This is what fireman recommend for escape doors. Another benefit of the knobcylinder is you can't forget your key on the inside of the door. A Knobcylinder will be meassured the same as a standardcylinder, only a knob is placed on the inside. 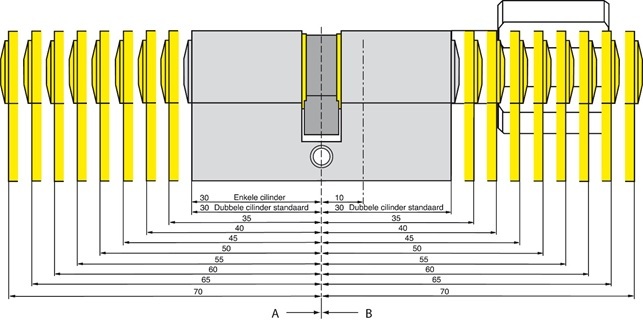 This meassure will be shown as followed: A/B knob = 50/45 knob. In this example the knob is placed on the 45 side.